The Kinetronics antistatic gloves discharge static electricity and clean dust and dirt from sensitive materials. A special mixture of conductive fibres and soft synthetic thread guarantees successful cleaning. The specific ohmic resistance of seven megaohms guarantees that there is no risk of arcing to damage the materials. 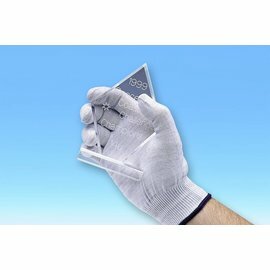 The Kinetronics antistatic gloves are ideal for the safe handling of films, plastics, optical equipment, semiconductors and printed circuit boards. The gloves protect the material from scratches and fingerprints. If the gloves are dirty, they may be washed in mild detergent and water, and then dried in a tumble drier. The gloves are available as pairs in three sizes.